Range: Western lowlands near the Cameroon coast to central highlands of Zaire and Uganda. Status: In danger of extinction because of encroachment on their habitat and continued hunting. Diet in the Wild: Plants, berries, and leaves. Diet in the Zoo: Similar to the diet in the wild. Taller and fatter in captivity. The gorilla is the largest and most powerful of all living primates. The male gorilla is about 6 ft. tall and weighs about 500 lbs. The female is about 5 ft. and weighs about 200 lbs. The gorilla has a short muzzle and a very stocky build. He has a flat nose with wide nostrils and strong jaws. The eyes and ears are small and the ears lie close to the head. The forearm is much larger then the upper arm, and the hands are very large. The skeletal structure is much like that of a human, but the bones are thicker, the arms are longer, and the legs are shorter. They also lack the curvatures in the spine that help to keep them upright. This results in a stooped position, using the knuckles to support its weight. Gorillas tend to be peaceful and sociable, usually living in groups of 5 to 15. A group usually consists of one silverback (older male), one or two subdominant males, several females, and the young. Most of the young males are driven out at maturity and form all-male groups or may loosely attach themselves to other groups (bands). If a silverback is defeated by a male challenger he will leave the group and lead a solitary life. Every night gorillas build a makeshift camp after a day of picking plants, berries, and leaves. Sometimes the female and young sleep on a platform made of branches and leaves in a tree, while the male sleeps at the base of the tree. A hooting call is given off by the gorilla to alert the others of possible danger. Other calls include grunts for discipline, and low growls which show pleasure. The gorillas have no real enemies, but they will beat their chests to show power and to intimidate others. Intruders that are chased away may be caught and killed, but those that stand their ground are not harmed. 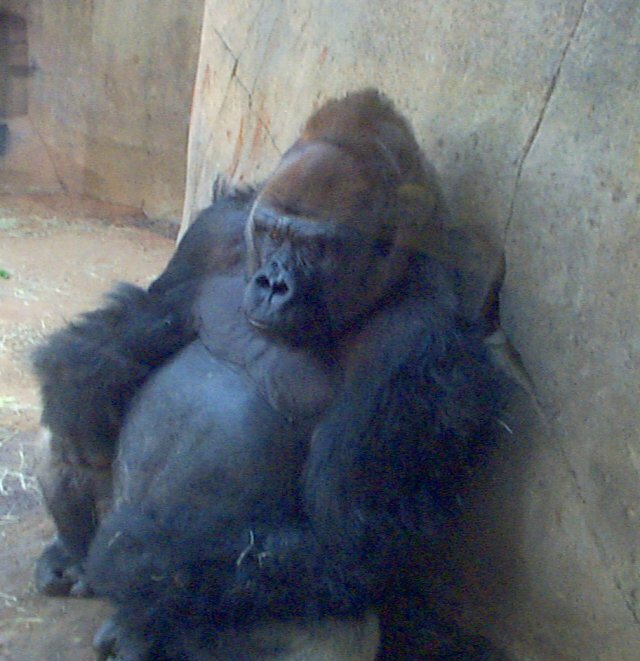 The sexual cycle in gorillas are the same as in humans. The female menstruates about every 28 days and can mate at any time. Twin or single births happen after 9 months. They breastfeed for about a year and they mature at around 11 or 12 years. The lifespan is usually 30 years. Intelligence: The gorilla is not very curious or excitable. It is more likely to solve a task out of interest than to earn a reward. 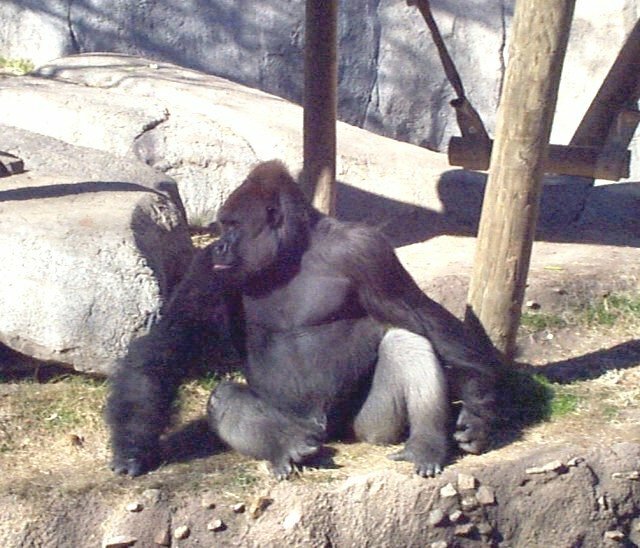 They are also capable of communicating through sign language (one gorilla has mastered over 100 words), and can discriminate between geometrical shapes. Comments from the Zookeeper: "Gorilla's are usually laid back, they are not as active as chimps." They only eat fruits and plants, no meats." Personal Observations: The gorillas amazed me in how similar they are to humans. They seem to be very calm and don't get bothered that easily. The features are so big on the gorilla. Such as the hands, feet, head, etc. They are interesting animals, but I would be scared of their power and strength. Sources: "Gorilla," Microsoft (R) Encarta. Copyright (c) 1994 Microsoft Corporation. Copyright (c) 1994 Funk & Wagnalls Corporation. Walker, Ernest P. "Walker's Mammals of the World". 4th ed. Baltimore: Johns Hopkins University Press. 1983. "Wild Life Fact-File". Card #2. vol. 1. 1991. BV/Imp USA Inc.
Wrangham, Richard H. "Chimpanzee Cultures". Cambridge, Mass. : Harvard University Press. 1994.